My niece texted me this morning at 7:00 am asking me if I had a good recipe for organic carrot cupcakes. I recommended a couple of websites and told her that I would make a batch today and post the recipe. These cupcakes are almost all organic. Every ingredient is organic except for the spices and a very small percentage of the cream cheese. But more importantly, they are VEGAN and they contain no granulated or powdered sugars, and are made with whole grain flours. Oh and by the way, they are wondie!!! This recipe makes about 10 cupcakes. The baking cups I used are very small, about 2-1/2" deep. I like this brand (If You Care) because their products are unbleached (contain no chlorine) and are better for the environment. However, they do make smaller cupcakes. So just keep that in mind because you may want to double the recipe if you use different baking cups. Note: If you can't find spelt four, then you can use whole wheat pastry flour for the entire recipe. I just like the texture spelt provides to baked goods. Also, I made my own applesauce (2 organic pink lady apples, peeled, cored and diced, 1/2 cup filtered water, and 1/4 tsp ground cinnamon). Place ingredients in a sauce pan and cook about 20 minutes until soft. Blend in a food processor until smooth. Line a 12 cup cupcake or muffin tray with baking cups. If making applesauce from scratch, prepare and set aside to cool. In a medium size bowl, sift flour, baking soda, baking powder, salt and spices together and set aside. In a large bowl, whisk ground flax seed and water until frothy. Add maple syrup, applesauce, vanilla, oil, carrots, walnuts and raisins and stir well to combine. Using a 1/4 measuring cup, scoop an equal amount into each baking cup. Place cupcake tray in the middle of the oven and bake for 18-20 minutes, turning once after 15 minutes of baking. Using a toothpick check to see if they are done in the center. Let cupcakes cool for about 15 minutes on a cooling rack before removing. Note: I have used dates and maple syrup before to make a glaze for my Greek Tahini Cake, except the glaze was made with tahini, and not cream cheese. For this recipe, the date puree provides a natural sweetness to the cream cheese, therefore eliminating the need for powdered sugar. Heat water to boiling and pour over dates and let sit for about 20 minutes so that they soften. Place dates in a strainer and remove any excess water by pressing with the back of a spoon. Place dates in a food processor, along with maple syrup and blend for about 3-4 minutes, scraping the sides of the bowl, until you have a creamy puree. Add vanilla extract and cream cheese and blend until smooth. Remove frosting from the food processor and fold in grated orange zest. Chill for about 1 hour before using to firm to a spreading consistency. I chilled mine in the freezer for about 30 minutes, stirring every 10 minutes or so. 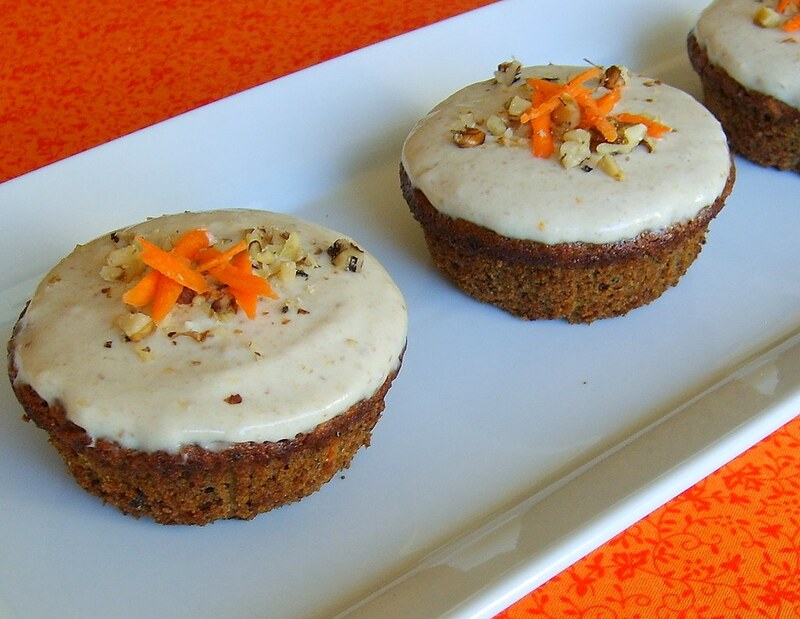 Spoon about 1-2 tbsp frosting over each cupcake and garnish with chopped walnuts and shredded carrots.